If you say something that hurts their feelings, you're no better than a "cop-killer." Glenn Beck, acting in his self-appointed role as a punitive populist prophet, has urged his audience to join “hand-in-hand, arm-in-arm,” and “ring” their local police departments in prayer. The local police are “under siege,” Beck tremulously insists, and divine intervention on their behalf is necessary. 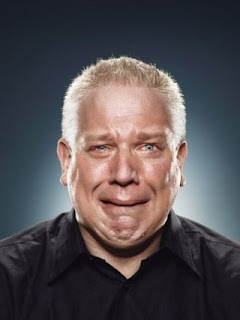 Beck hasn't yet urged Americans to act as human shields on behalf of the heavily armed, body armor-clad functionaries who are supposedly paid to protect them. Some police union officials haven't shied away from suggesting that the public has a moral duty to protect the police, despite the fact that police have no reciprocal obligation to protect individuals threatened with criminal violence. Residents of Huntsville, Alabama who declined to intervene to help a police officer subdue a suspect could face criminal prosecution under a state statute requiring them to assist an officer in trouble. Had the situation been reversed, however, police officers would face neither criminal nor civil prosecution for declining to aid a citizen under assault by a suspect. A man named Devonte Conerly who was suspected in a hit and run incident, allegedly tried to disarm the police officer who stopped him. Several officers responded to a call for assistance and eventually subdued and handcuffed Conerly. They then rebuked several bystanders who had declined to intervene. 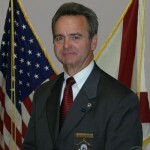 In fact, under the Alabama state legal code (Section 13A-10-5), “A person commits the crime of refusing to aid a peace officer if, upon command by a peace officer identified to him as such, he fails or refuses to aid” the officer in effecting a “lawful arrest” or preventing “the commission by another person of any offense.” This dereliction of a supposed duty is described as a Class C misdemeanor. This power of summary verbal conscription by police, as liberty activist Matt Agorist has noted, is written into law in 44 of the 50 of the state-level subdivisions within the American soyuz. Davis is hardly the first police official to express disgust and outrage over the reluctance of the public to intervene on behalf of an officer during an altercation. 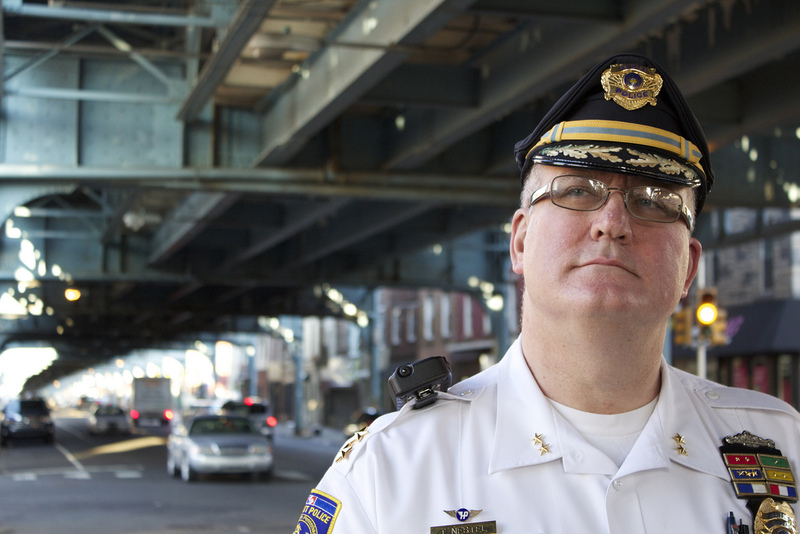 "I'm frightened for my cops": Chief Nestel. While this formulation doesn't require that a defendant prove his innocence during a trial, it assumes that a "refusal to aid" an officer is unreasonable, and places on the accused the "burden" of overcoming that presumption. The default assumption is that the accused committed an offense by doing nothing. Of course, in the event that a citizen obeys a police officer's command to intervene, and is unable to help subdue the suspect, he could conceivably find himself charged with obstruction, which is a Class A misdemeanor. This means that a police officer can charge an onlooker who declines to participate in an arrest, or – conceivably – one who makes an unsuccessful bid to help. It should also be remembered that a citizen, unlike a police officer, is not protected by "qualified immunity" in the event the subject of an arrest is injured without justification. In any case, citizens are told that they have a legal duty to come to the aid of an embattled police officer – but police have no corresponding duty to intervene on behalf of a citizen. In that case, two women reported an assault on a friend to the police. Officers were dispatched to the scene of the crime, but declined to enter the building. The desperate women called again, and this time the department didn't even bother to respond. The attackers overheard the second call, and punished the women who had sought police assistance by detaining and assaulting them for 14 hours. Coward cop with killer: Howell (l.) with Gelman. Police have “no special duty” to aid a citizen facing an immediate lethal threat, contended David Santoro, City Attorney for New York, in a successful bid to dismiss a lawsuit filed by Philadelphia native Joe Lozito. 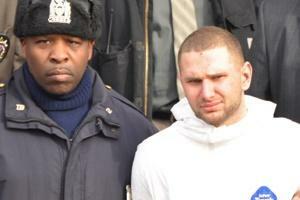 Lozito was nearly killed while subduing a slasher-killer named Maxim Gelman during a 2011 subway attack. Lozito, an unarmed man trained in mixed martial arts, tackled and subdued Gelman, who was being sought for the murder of three people. Howell did nothing to detain or subdue the murderer, but he was the one photographed triumphantly escorting Gelman away from the scene in handcuffs, and was hailed as a “hero cop” in the media. He later admitted to a member of a grand jury that he hid from the suspect out of fear for his safety -- and no moral or policy consideration is more important than the sacred principle of "officer safety." The unqualified duty to protect the police extends from the streets to the jury room. Nowhere is this assumption more deeply entrenched than Harris County, Texas, where Sheriff's Deputy Darren Goforth was murdered last week. This reflects the fact that the Harris County Courts use a board of commissioners to select grand jurors, a process that tends to fill grand juries with older, more conservative panelists – retirees who are “elite members of the community,” in the assessment of District Judge Denise Collins. The ideal Harris County juror would be sort of person who nods along with, or chuckles approvingly over, Bill O'Reilly's authoritarian monologues. A second filter for police shooting inquests has been the official in charge of reviewing police shootings on behalf of the District Attorney, Clint Greenwood, a police officer. Last year, Greenwood was hired as a major at the Harris County Sheriff's Office, a position he most likely wouldn't have landed had be pursued police shootings with vigorous impartiality. The most significant factor behind the long string of police exonerations, however, has been the DA's practice of having jurors “play the role of police officer” in a training simulator as part of their deliberations. It is not incidental to this discussion that Kennedy “edits the Houston Police Officers' Union publication,” the Chronicle reported. Not surprisingly, criminal indictments of police officers who use lethal force are all but unheard of in Harris County. This would suggest either that police officers within that jurisdiction are beings untainted by human weakness, or beyond human accountability. Sheriff Hickman's anger was genuine and understandable, but his exhortation was either insincere or not fully thought through. The official view of the caste to which he belongs is that police lives matter more than those of mere Mundanes – because every police officer is an incarnation of the divine state, to whom reflexive obedience is to be given, and whose sanctified personage is owed protection by the lesser beings who surround him. This means shielding police not only from violence directed against them, and the legal consequences of violence used by them, but also from the “rhetorical violence” supposedly committed by people who scrutinize their conduct and condemn their abuses. During the thirty-day period in which Deputy Goforth was murdered, the number of people shot by police (at least 84 -- remember, the killings of Mundanes are not officially tallied) was roughly equal to the total number of police killed on-duty by all causes – including traffic mishaps, work-related accidents, heart attacks, and other non-violent episodes – through September 2. Firearms-related line-of-duty police deaths are down by 13 percent so far this year. 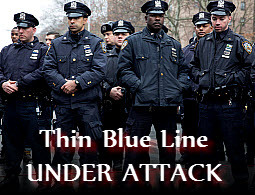 Police union officials and the pundits who regurgitate their pre-chewed soundbites are pretending that "anti-police rhetoric" is inhibiting cops and emboldening cop-killers. The available use of force statistics suggest that something akin to the reverse may be true. That possibility hasn't occurred to those who urge the public to form a protective barricade around their armed overseers. If government security provisioners do not want to listen to criticism then they need only allow competition. Let people express their concerns with security providers not in words but in subscriptions. Restore to Americans the fundamental right of consumer choice. Restore to Americans the freedom to choose the security providers they feel are the best in a free market in competing free enterprise security service providers. No one is being forced to pray for the safety of fellow human beings. Pray all you want for the badged thugs. You still have that bit of freedom. But you better understand that those with badges and guns, are ONLY there to protect your fellow elite citizens you love so much. You know them as "government". There is no reason why we need government agents with badges and guns. They protect no common citizen. There are no good cops. I've got to know, Will. How do you do it? How do you not just give up in impotent frustration? You do far more than I do, yet we fall farther and farther behind the State every day. How do you keep from slipping into apathy over it all? I'm serious when I ask this, because I find myself getting more and more apathetic by the day. People will nod along and agree with me wholeheartedly, then turn around and continue to support the status quo. To quote Joss Whedon's "Dr. Horrible's Sing-Along Blog" (which I highly recommend you spend the 45 minutes to watch, because it's extremely entertaining) "Well, the status is NOT...quo." Anyway, to the point of this particular blog. If I found myself in court trying to justify why I didn't help a cop, I'm sure I'd go to jail. I can easily see myself in court stating, "If a cop was on fire, I wouldn't piss on him to put him out." He's paid to be a "public servant" that supposedly "protects and serves" yet we know he isn't a servant of the public and he doesn't protect or serve anything but those in power. If they want me to put myself in danger to assist a cop, I demand they pay me, and clothe me in qualified immunity, as well. Re: "Under Alabama's statute, onlookers are not liable to prosecution if the failure to render aid “was reasonable under the circumstances,” but the burden of demonstrating that this is the case is placed upon the accused. " You misread the statute, which says that burden of proof is not altered. This formula doesn't require that a defendant prove his innocence, but it does assume that a "refusal to aid" an officer is unreasonable, and places on the accused the "burden" of overcoming that presumption. I was going to add that even if Dan Grayson's view was correct, most of your readers understand that any prosecutor will present the case to any jury as though the standers-by should have rendered aid. And, unfortunately, most juries these days will buy the prosecutors view of the law and convict the individual in question. "A person commits the crime of refusing to aid a peace officer if, upon command by a peace officer identified to him as such, he fails or refuses to aid." 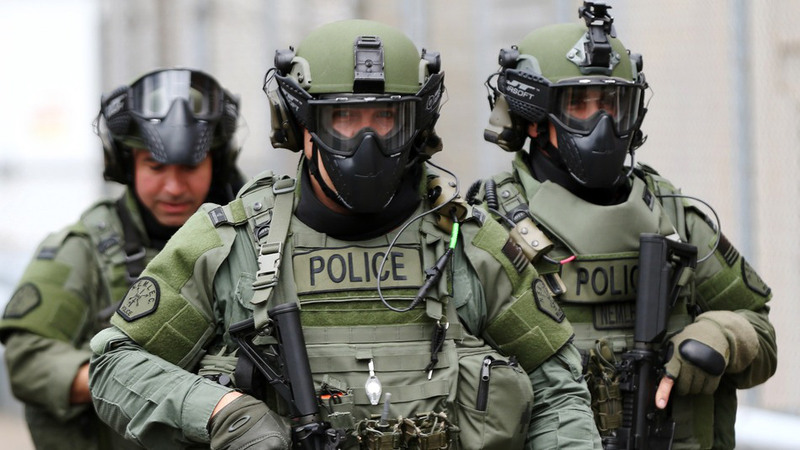 ARE there any peace officers working for the police any more? Still have NOT heard from my state representatives regarding arming drones with 'nonlethal' weapons. According to the bill's author, Representative Rick Becker, House Bill 1328 was amended with the weapons provision to insure his 'primary intent requiring law enforcement to obtain a search warrant prior to being able to conduct surveillance on private citizens' was legally established. Well...I'm not sure why we have had 24/7 drone surveillance over our farm...at least since I first noticed them in 2002. We aren't on any USDA Programs requiring compliance. In fact, we don't do much of anything but graze a few sheep & goats, horses, & run a tiny flock of chickens. These are the LARGE drones, too! They have running lights, seemingly perpetual operating systems, and are extremely nimble in their abilities to move in for a closer 'look' when someone goes out to check animals after dark or 'take a leak'. Well, anyway, maybe ordinary folk need to carry around their own armed-drone emergency packs to be deployed ONLY when officers finding themselves in overwhelming difficulties are in need of assistance. Under the Alabama statute, who will bear responsibility if a citizen attempts to offer aid, and an officer misinterprets the move, thinks he's being engaged by an additional perp, and the officer inflicts grave to fatal injury on the good Samaritan? So if a citizen, ordered to help by a government employee, "accidentally" plants a steel toed boot to the government employee's temple, that will be excused the same way a government employee who "accidentally" commits battery on a citizen would be, correct? We can't expect all blows to land correctly in the "heat of battle", right? We can't be "Monday morning quarterbacking" when a citizen fears for his life when ordered to help a government employee. Or if the citizen under those same orders picks up the government employee's weapon and fires all 15 rounds randomly in the general direction of the altercation, he will be able to say "I was in fear for my life." correct? That seems to be SOP for most police agencies. Or maybe the citizen dowses both combatants with a debilitating chemical agent, that would be approved, right? After all, cops routinely spray large crowds with tear gas, coating the innocent along with the "guilty". I am speechless, I knew they all have over - inflated egos, but this is truly over the top. Cops complaining about sole being suspended with pay. They truly live in a bubble to not see the irony. Yeah, the entire concept of "rhetorical violence" and "verbal violence" is ridiculous. When did we become such victims that someone saying they think you're wrong constitutes violence? To make it worse, these claims to victimization are coming from the most violent caste of Americans. When Insulting the Police is a "Crime"